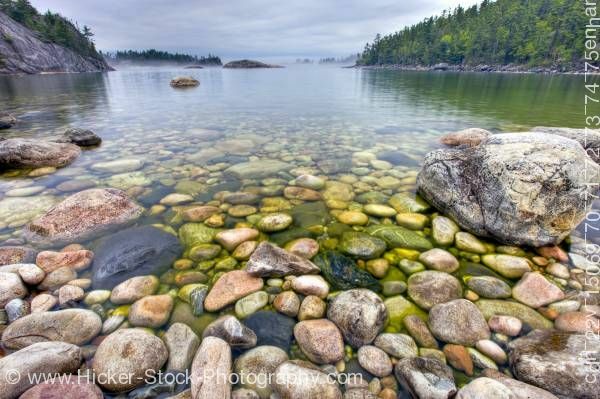 This stock photo includes the rocky shoreline of Sinclair Cove, Lake Superior, Lake Superior Provincial Park, Ontario, Canada. The clear and still water is like glass, revealing the colourful rocks laying just beneath the surface along the shoreline of Lake Superior. It's shores are fringed by Boreal Forest which have somehow taken root on the smooth rounded hills - remnants of ancient mountain ranges. The protected shores and waters of Sinclair Cove in the pristine Lake Superior Provincial Park of Canada, are a hidden gem. Sinclair Cove is situated in Lake Superior Provincial Park in Ontario, Canada and is a location often overlooked by visitors because of its close proximity to Agawa Rock. It is however, only a short distance further along the road and is the perfect place to launch a kayak or canoe to paddle and explore the shoreline of the cove.